Melting of the west Antarctic ice shelves are not able to stop, take the consequences of the rise in sea surface. With the speed of ice melting over the years, predicted increases in sea surface compiled by the Inter-governmental Panel on Climate Change to be adjusted. 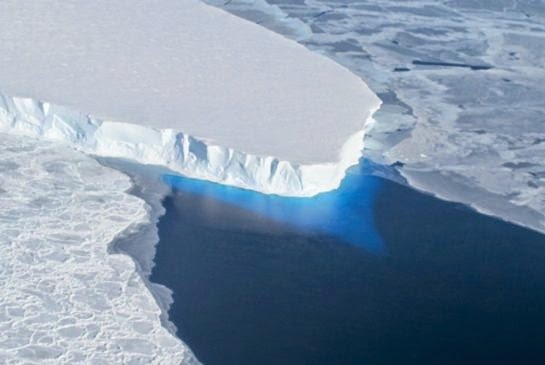 "Part of the West Antarctic ice shelves melt and can not go back," said Eric Rignot, a professor of Earth science at University of California, Irvine. "Melting can not be stopped," said him. No big hill behind the glaze that can withstand water from the melted ice to not fall into the ocean. "This melting will have a big impact on rising sea surface around the world," said Rignot. "This will raise the sea surface to 1.2 meters or 4 feet," he said and the results that published in Geophysical Research Letters. Rignot study is one of the results of research on melting ice in Antarctica that was released simultaneously on Monday, May 12, 2014. Well from a different study done by Ian Joughin and published in the journal Science. Both look Antarctica and predict changes in future trends in computer simulations. Rignot, which is the polar ice researcher at the Jet Propulsion Laboratory, digging data from satellite monitoring, observing with aircraft and ships, as well as direct menyurvei ice in Antarctica. Research results reveal, that melting ice in Pine Island slowed last few years. However, it has happened for quick melting has occurred many years previously. On the other hand, based on data since 2006, in Thwaites, the ice melting faster. According to Joughin results stating that the Thwaites ice melting could cause sea level rise up to 61 cm. The conclusion is based on data trends Antarctica in the future, coupled with radar data which allows her to see the rocks under the ice. Joughin, who was a polar ice specialist at the University of Washington said, that the ice melting was the inevitable. Ice can melt all in a span of 200 to 1,000 years. "All our simulations show that the ice melting will make sea level rise of less than 1 cm for several hundreds of years, and then boom, will last much longer," he said. Predicted increases in sea surface related to climate change to date have not included the ice melting in Antarctica. According to Sridhar Anandakrishnan, an Earth science professor at Pennsylvania State University, who is not involved in the study above say that the results of this research will make the UN to change their predictions. As quoted from the AFP on Monday, May 12, 2014, it says that the limit on the increase in sea surface about 90 cm or about 3 feet.